But sanctuary is hard to find. With malfunctioning androids and angry rebels at their backs, the group hopes to press on for the neighboring city of Cadence. But Ella’s chosen path is challenging… life-threatening, even. Worse, the boy she loves is acting distant, and not at all like the person she first met in Nexis. But then Ella learns a secret… and it changes everything. Droids have destroyed Evanescence and Ella, Quint, Gus, and a group of residents manage to escape the city alive. Ella feels responsible for the deaths of so many people and is ready to do whatever it takes to keep the survivors alive. Life outside of Evanescence eventually leads them to come into contact with the disfavoured and we start to learn that there is far more going on than we thought. Outside of the walls of Evanescence, Ella sees people she thought she'd never see again. The side story of the romance provides a good dollop of teenage drama and angst alongside their fight for survival. But what I loved most about this story is it doesn't really go where I excepted and it is full of surprises. In the end, it is clear that Ella is an amazing heroine and she is willing to make huge personal sacrifices for the greater good. 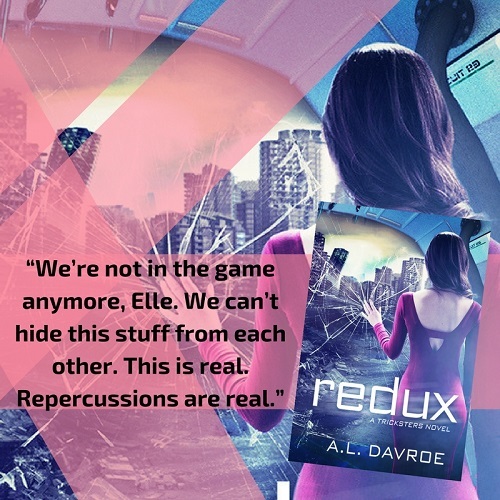 I was completely engrossed in Redux every step of the way and I can't wait for book three. At the start of Redux, I was afraid I'd have to reread Nexis. It had been over 15 months since I read the debut in the series, and had read 500+ books in the interim. While I can't say it wasn't a bit of a struggle in the first few pages to situate myself into the universe, characters, and past events, Davroe did a fabulous job leading the reader to remember bits from Nexis, without devolving into an info-dump rehash. So I applaud the author on the seamless delivery of past information. With that being said, if you enjoy rereading, and you read the first close to its release, I'd suggest rereading prior. As I read Redux, I had moments where I thought it would have been nice to reread to capture the subtle nuances that may otherwise be lost on the reader. Those heart-tugging, gut-wrenching moments, and bits of foreshadowing, where the reader murmurs, "ahhh..." on a reread. I do not recommend this being read as a standalone or out of series order. From this point on, to avoid spoilers, I'm going to have a difficult time formulating a cohesive review. It truly would ruin the journey. Redux was a page-turner, where I found myself getting snippy when torn from the story. I just wanted to sit down and devour it from page one until the end. This fast-paced read is filled with intriguing world-building, adventuring, love and loss, which hit all my emotions. The opulent, domed city of Evanescence is powered down, with its inhabitants scattered in the wind, and/or no longer among the living. Ella and company try to save the few remaining aristocrats by seeking to locate a sanctuary. There's no real comfort and security, so Ella has to have the backs of her companions. Nothing goes as planned, including all the machinations plotted by the original Tricksters, which put them into the mess they are dealing with now. Lives are lost, friendships are made and tested, and relationships die while others bloom. Ella is still a strong role model, making good choices with both her head and heart. In a world where the cast of characters is either vapid – and only thinking of their wants and needs – or logical to a fault – where they are missing empathy and compassion, only seeing people as tools, even loved ones and friends – Ella stuck true to her roots, as the perfect mix of both personality types. Ella bridges the gap as the Savior. Ella does her best, making sacrifices for the good of all the people. There are several romantic entanglements, adding a nice dose of teenage angst, but they are far from insta-love and do not subtract from the very involved plot. While I wasn't surprised by the direction the author took Ella's romantic interests, I was shocked by another twisty plot point. Young adults and the young at heart will find the romance in Redux to add to the overall enjoyment, give us a reason to root for specific characters. It truly is complementary to the story arc, not propelling it but giving everyone a reason to hope in a desolate situation. Redux was well worth the wait. Usually when I'm floored by an amazing debut novel, it all goes downhill in the sequel. 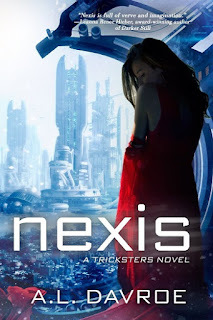 Nexis and Redux are both equally worthy of a 5-star rating, which I never give lightly. I can't wait to see what the author has in store during the next book. Recommended to fans of Young Adult, Fantasy, Science-fiction, Dystopian/Utopian fiction, MMORPG video game based novels. Young Adult age-range: 14+ Adult Language. Violence. Kissing & fade-to-black sexual situations. For reviews & more info, check out our Nexis posts from Erica & Veronica. A.L. Davroe grew up in Connecticut and, after traveling to many countries, many states, and many fantasy realms – sometimes even living in them – she has decided that Connecticut is a wonderful little state. She likes books, cats, chai tea lattes, and the word "chime." By day, A.L. makes cheese for a local artisan dairy and, by night, A.L. writes in various sub-genres of adult and YA fantasy, science fiction, horror, and romance, but most of her work tends to have a revisionist twist to it. You can follow her various forays into aesthetic merriment and misbegotten shenanigans on Facebook or Twitter and you can check out her current musical obsessions on her website. 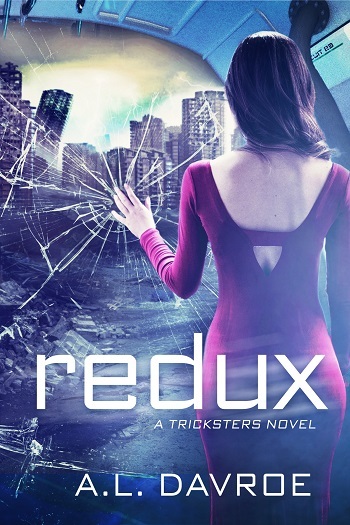 Reviewers on the Wicked Reads Review Team were provided a free copy of Redux (Tricksters #2) by A.L. Davroe to read and review.